The Heathland Restoration Project area comprises a hillside sloping approximately west (top) to east (bottom). The area is roughly triangular in shape, with the point of the triangle forming the southern end, and the broad base forming the northern end. It is bounded by woodland on all sides except for half of the eastern region. The project area has been divided into nine longitudinal strips which run east/west up and down the slope. These are managed in different ways. 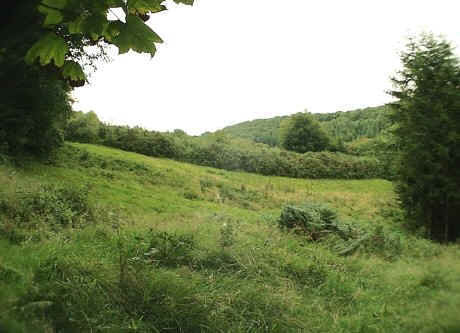 The top (west) of the slope is bounded by a bridle path which runs through tall mature broadleaf woodland. This is composed of trees such as Beech and Oak. 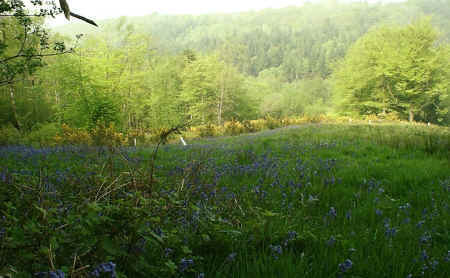 This woodland is part of a larger area of woodland, known locally as 'Bluebell Woods'. The name is derived from the spectacular masses of Bluebells which grow beneath the trees, producing extensive blue carpets in the spring. Looking west up the slope to the 'Bluebell Woods' at the top of the Heathland Project area. Strips 1 - 4 form the southern area of the triangular heathland restoration area. Strip 1 is situated in the point of the triangle. These strips are bounded by woodland on all sides. 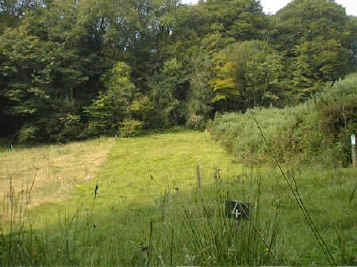 The western end of the strips is adjacent to the tall Bluebell woods, while to the south is immature coniferous woodland. This is not as tall as the broadeaf woodland and as it is lower down the slope, it does not overhang the restoration area as much. 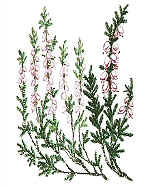 It therefore has less of a shading effect than the western woodland. 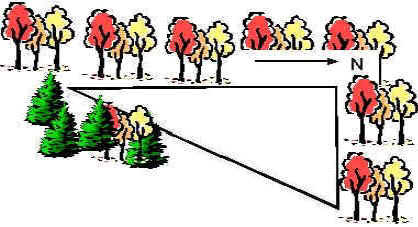 Intermixed with the coniferous trees are a few taller broadleaf trees such as Sweet Chestnut. The northern boundary of the Heathland Restoration Project area is formed by an area of wet woodland. This initially contained many non-native cherry trees which seeded extensively all over the project site. These cherry trees have since been removed from the Wet Woodland, as part of a habitat restoration program. The remaining trees in that area are mostly willow, birch, oak, beech and Holly.